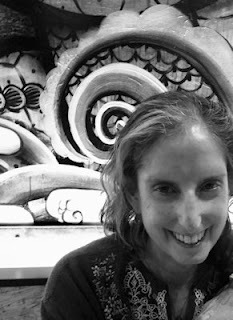 Please welcome Jessica Reisman to The Qwillery. 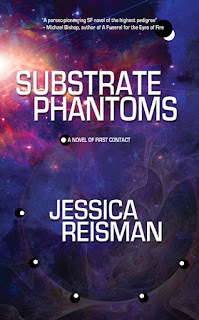 Substrate Phantoms was published on May 16th by Arche Press (Resurrection House). Jessica: I started writing poems and short fiction at nine years old; my first story was inspired by Watership Down. Why would be two things: first, reading stories and loving them and wanting to create worlds and stories myself; second, because visions of beautiful possibilities crowded my head, but my art skills weren't up to the task of bringing them into being, so I started to try and bring them to life with words, instead. My writing is still very visual. Jessica: I'm a hybrid in that I do a whole lot of note writing, character background work, world building, etc., before I start writing, and have an idea of the overall arc and shape of the story, but plot only comes to me organically, from the characters and the world. With novels that just means I find my way slowly sometimes. With short fiction it often means I don't find the actual plot until second or third draft. Jessica: My dayjob, it keeps getting in the way of writing time. :) A less flip answer would be that I find beginnings of stories challenging, and I find after-writing challenging--that is, everything that comes after to get the work published, noticed, read. The challenges involved in the writing itself are challenges I enjoy, so I don't think of them as "challenging," if you see what I mean. I'm one of those writers who actually do love the writing process itself. Jessica: Other writers, first and always. My earliest direct influences in writing were Samuel Delaney, Ursula Le Guin, and the Lord of the Rings trilogy, followed soon by Patricia McKillip, Tanith Lee, and C.J. Cherryh. Other influences are a love of art and nature; a never diminished awe for the amazing possibility and wonder of this universe and this planet; and a longing for community, connection, kindness, and a more just society. TQ: Describe Substrate Phantoms in 140 characters or less. 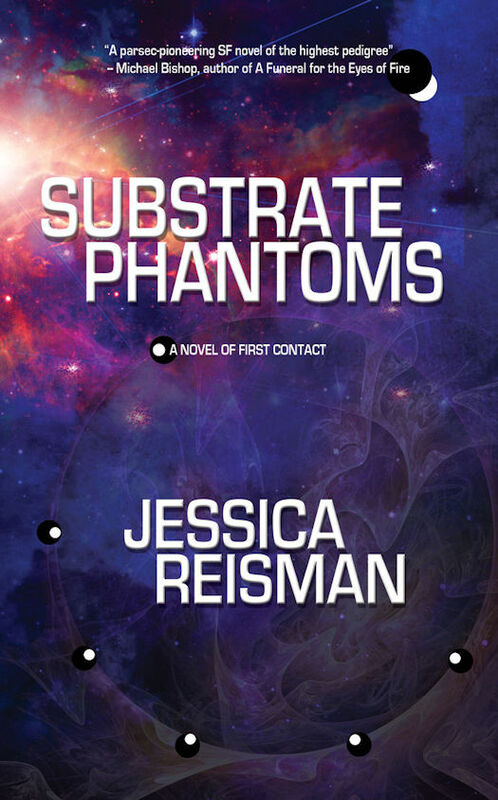 Jessica: Substrate Phantoms is a far future literary space adventure that opens on a space station haunted by strange phenomena. TQ: Tell us something about Substrate Phantoms that is not found in the book description. Jessica: In its very first incarnation it was sort of the Orpheus myth in space. TQ: What inspired you to write Substrate Phantoms? What appeals to you about writing Science Fiction and in particular an Alien Contact story? Jessica: I love space opera and adventure, and the first blush of inspiration for SP was the seemingly haunted station, and how we, us humans, keep bringing the more Gothic/superstitious preoccupations of our psyches forward with us, no matter how much our technology advances. What appeals to me about alien contact, particularly in this case first contact, is the dichotomy between the fact of so many planets, so many galaxies, so much potential "alien" life, when we still haven't, as far as we know, had any contact with any, and still, to our detriment, treat others within our own species as alien. TQ: What sort of research did you do for Substrate Phantoms? Jessica: Everything from space station mechanics and disaster experiences to agricultural/farming systems and neurological disorders. My usual research habits are wide-ranging, tangent-prone, and perhaps a little shallow. TQ: In Substrate Phantoms who was the easiest character to write and why? The hardest and why? Jessica: Jhinsei is the easiest for me. I wouldn't say that I am Jhinsei or Jhinsei is me, but we have some things in common and he's definitely a cognate of one of the mes within me. And Mheth was the hardest, because he's far from me in personality and behavior. Also, I wanted Mheth to have a shade of Mercutio from Shakespeare's Romeo and Juliet, a certain morbid, slightly manic whimsy, and that was a bit of a challenge--a fun one, but still a challenge. TQ: Why have you chosen to include or not chosen to include social issues in Substrate Phantoms? Jessica: I don't think it's a choice, at least not for me; social issues are unavoidable. In fact I consider myself a writer of social science fiction--one of the things I've always most loved about science fiction (and fantasy) is its vast and glorious potential to envision other and better possibilities for societies, for ways of being, and to comment on ways that are maybe not so helpful or useful to us. For me, it's integral to the act of writing--not to be didactic or overt, but writing from a real place within means those social issues are just going to be there, in the way you envision your world and the characters, relationships, politics, economies, and life within it. Saying you don't include social issues simply means you include the status quo unexamined, doesn't it? TQ: Which question about Substrate Phantoms do you wish someone would ask? Ask it and answer it! Q: Would you like to see the book as a beautifully illustrated graphic novel or perhaps a movie? A: Yes, yes I would! TQ: Give us one or two of your favorite non-spoilery quotes from Substrate Phantoms. Wind splashed, sudden and violent, across the fields and against the semiperm. Stronger winds moaned behind it. The roiling, flickering murk Mheth had seen in the distance was almost upon them. Flickering murk hit the semiperm, with a huge rush of wind. It went over the building in a wave, filling the air with little lightnings and smudges of color in the murk. There was an odd pattering Mheth thought must be rain, but then thousands, hundreds of thousands of bugs began tumbling into the semiperm, pitching along the roof, spitting colored light on impact, chartreuse, verdigris, dark gold, angry reds. Jhinsei sat up, eyes wide. It seemed to go on for a long time, droves of insects hurtling on the wind, gusting torrentially into the semiperm and everything else in their path, flashing stains of gleaming color all around. The noise dinned and drowned. It wasn’t just the sound of insects pummeling semiperm, walls, and roof, but a sibilant clicking washing through it all from the insects themselves. A scent like cardamom and hot sand burned the air. The moud storm raged for maybe ten minutes. Then, slowly, the noise of wind and pummeling insect bodies lessened. The sound of rain came, gentle in the wake of the violence; occasional straggling insects, tiny turning flecks of colored light sparked and disappeared. Scents of cool and mineral rain washed through the semiperm. Jessica: I have a story coming out at Tor.com June 7th called "Bourbon, Sugar, Grace," for which I've recently seen the fabulous art. I'm excited for people to read it (and Substrate Phantoms!). I'm working on the sequel to Substrate Phantoms and I have an alternate 1600s South China Seas fantasy novel soon to be going out looking for a home. Jessica Reisman's stories have appeared in numerous magazines and anthologies. A graduate of Clarion West 1995, she is a SFWA member. Her story “Threads” won the South East Science Fiction Achievement award. Her far future science fiction adventure SUBSTRATE PHANTOMS, from Resurrection House Books, is out in May 2017, and her story "Bourbon, Sugar, Grace" will appear on Tor.com in June 2017. She currently calls Austin, Texas home. Find out more at storyrain.com.